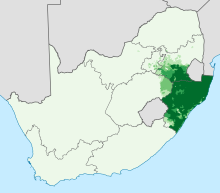 Zulu (/zuːluː/) or isiZulu (Zulu: isiZulu) is the language of the Zulu people, with about 10 million speakers, the vast majority (over 95%) of whom live in South Africa. Zulu is the most widely spoken home language in South Africa (24% of the population), and it is understood by over 50% of its population. It became one of South Africa's 11 official languages in 1994. According to Ethnologue, it is the second most widely spoken of the Bantu languages, after Swahili. [a] Like many other Bantu languages, it is written with the Latin alphabet. Geographical distribution of Zulu in South Africa: density of Zulu home-language speakers. Zulu migrant populations have taken it to adjacent regions, especially Zimbabwe, where Zulu is called (Northern) Ndebele. Maho (2009) lists four dialects: central KwaZulu-Natal Zulu, northern Transvaal Zulu, eastern coastal Qwabe, and western coastal Cele. The Zulu, like Xhosa and other Nguni people, have lived in South Africa for a long time. The Zulu language possesses several click sounds typical of Southern African languages, not found in the rest of Africa. The Nguni people have coexisted with other Southern tribes like the San and Khoi. Zulu, like most indigenous Southern African languages, was not a written language until the arrival of missionaries from Europe, who documented the language using the Latin script. The first grammar book of the Zulu language was published in Norway in 1850 by the Norwegian missionary Hans Schreuder. The first written document in Zulu was a Bible translation that appeared in 1883. In 1901, John Dube (1871–1946), a Zulu from Natal, created the Ohlange Institute, the first native educational institution in South Africa. He was also the author of Insila kaShaka, the first novel written in Zulu (1930). Another pioneering Zulu writer was Reginald Dhlomo, author of several historical novels of the 19th-century leaders of the Zulu nation: U-Dingane (1936), U-Shaka (1937), U-Mpande (1938), U-Cetshwayo (1952) and U-Dinizulu (1968). Other notable contributors to Zulu literature include Benedict Wallet Vilakazi and, more recently, Oswald Mbuyiseni Mtshali. The written form of Zulu was controlled by the Zulu Language Board of KwaZulu-Natal. This board has now been disbanded and superseded by the Pan South African Language Board which promotes the use of all eleven official languages of South Africa. English, Dutch and later Afrikaans had been the only official languages used by all South African governments before 1994. However, in the Kwazulu bantustan the Zulu language was widely used. All education in the country at the high-school level was in English or Afrikaans. Since the demise of apartheid in 1994, Zulu has been enjoying a marked revival. Zulu-language television was introduced by the SABC in the early 1980s and it broadcasts news and many shows in Zulu. Zulu radio is very popular and newspapers such as isoLezwe, Ilanga and UmAfrika in the Zulu language are available in Kwazulu-Natal province and in Johannesburg. In January 2005 the first full-length feature film in Zulu, Yesterday, was nominated for an Oscar. In the 1994 film The Lion King, in the "Circle of Life" song, the phrases Ingonyama nengw' enamabala (English: A lion and a leopard spots), Nans' ingonyama bakithi Baba (English: Here comes a lion, Father) and Siyonqoba (English: We will conquer) were used. In some movie songs, like "This Land", the voice says Busa leli zwe bo (Rule this land) and Busa ngothando bo (Rule with love) were used too. The song Siyahamba is a South African hymn originally written in the Zulu language that became popular in North American churches in the 1990s. This situation has led to problems in education because standard Zulu is often not understood by young people. Zulu has a simple vowel system consisting of five vowels. There is limited vowel length in Zulu, as a result of the contraction of certain syllables. For example, the word ithambo /íːtʰámbó/ "bone", is a contraction of an earlier ilithambo /ílítʰámbó/, which may still be used by some speakers. Likewise, uphahla /úːpʰaɬa/ "roof" is a contraction of earlier uluphahla /ulúpʰaɬa/. In addition the vowel of the penultimate syllable is allophonically lengthened phrase- or sentence-finally. The plain voiceless plosives, affricates and clicks are realised phonetically as ejectives [pʼ], [tʼ], [kʼ], [tsʼ], [tʃʼ] [kxʼ]. When not preceded by a nasal, /ɠ/ is almost in complementary distribution with /k/ and /kʰ/. The latter two phonemes occur almost exclusively root-initially, while /ɠ/ appears exclusively medially. Recent loanwords contain /k/ and /kʰ/ in other positions, e.g. isekhondi /iːsekʰoːndi/ "second", ibhayisikili /iːbajisikiːli/ "bicycle". The slack-voiced consonants are depressor consonants. These have a lowering effect on the tone of their syllable. The consonant /ŋ/ occurs in some dialects as a reduction of the cluster /nɡ/ when it is not in stem-initial position, and is therefore always slack-voiced. The trill /r/ is not native to Zulu and occurs only in expressive words and in recent borrowings from European languages. Denti-alveolar /ǀ/, comparable to a sucking of teeth, as the sound one makes for 'tsk tsk'. Alveolar /!/, comparable to a bottle top 'pop'. Lateral /ǁ/, comparable to a click that one may do for a walking horse. Each articulation covers five click consonants, with differences such as being slack-voiced, aspirated or nasalised, for a total of 15. Zulu syllables are canonically (N)C(w)V, and words must always end in a vowel. Consonant clusters consist of any consonant, optionally preceded by a homorganic nasal consonant (so-called "prenasalisation", described in more detail below) and optionally followed by the consonant /w/. In addition, syllabic /m̩/ occurs as a reduction of former /mu/, and acts like a true syllable: it can be syllabic even when not word-initial, and can also carry distinctive tones like a full syllable. It does not necessarily have to be homorganic with the following consonant, although the difference between homorganic nonsyllabic /mC/ and syllabic /m̩C/ is distinctive, e.g. umpetshisi /um̩pétʃiːsi/ "peach tree" (5 syllables) versus impoko /ímpoːɠo/ "grass flower" (3 syllables). Moreover, sequences of syllabic m and homorganic m can occur, e.g. ummbila /úm̩mbíːla/ "maize" (4 syllables). Recent loanwords from languages such as English may violate these constraints, by including additional consonant clusters that are not native to Zulu, such as in igremu /iːgreːmu/ "gram". There may be some variation between speakers as to whether clusters are broken up by an epenthetic vowel or not, e.g. ikhompiyutha /iːkʰompijuːtʰa/ or ikhompyutha /iːkʰompjuːtʰa/ "computer". Stress in Zulu words is mostly predictable and normally falls on the penultimate syllable of a word. It is accompanied by allophonic lengthening of the vowel. When the final vowel of a word is long due to contraction, it receives the stress instead of the preceding syllable. Lengthening does not occur on all words in a sentence, however, but only those that are sentence- or phrase-final. Thus, for any word of at least two syllables, there are two different forms, one with penultimate length and one without it, occurring in complementary distribution. In some cases, there are morphemic alternations that occur as a result of word position as well. The remote demonstrative pronouns may appear with the suffix -ana when sentence-final, but only as -ā otherwise. Likewise, the recent past tense of verbs ends in -ile sentence-finally, but is reduced to -ē medially. Moreover, a falling tone can only occur on a long vowel, so the shortening has effects on tone as well. Some words, such as ideophones or interjections, can have stress that deviates from the regular pattern. Like almost all other Bantu and other African languages, Zulu is tonal. There are three main tonemes: low, high and falling. Zulu is conventionally written without any indication of tone, but tone can be distinctive in Zulu. For example, the words for "priest" and "teacher" are both spelled umfundisi, but they are pronounced with different tones: /úm̩fúndisi/ for the "priest" meaning, and /úm̩fundísi/ for the "teacher" meaning. In principle, every morpheme has an inherent underlying tone pattern which does not change regardless of where it appears in a word. However, like most other Bantu languages, Zulu has word tone, meaning that the pattern of tones acts more like a template to assign tones to individual syllables, rather than a direct representation of the pronounced tones themselves. Consequently, the relationship between underlying tone patterns and the tones that are actually pronounced can be quite complex. Underlying high tones tend to surface rightward from the syllables where they are underlyingly present, especially in longer words. The breathy consonant phonemes in Zulu are depressor consonants, or depressors for short. Depressor consonants have a lowering effect on pitch, adding a non-phonemic low-tone onset to the normal tone of the syllable. Thus, in syllables with depressor consonants, high tones are realised as rising, and falling tones as rising-then-falling. In both cases, the pitch does not reach as high as in non-depressed syllables. The possible tones on a syllable with a voiceless consonant like hla are [ɬá ɬâ ɬà], and the possible tones of a breathy consonant syllable, like dla, are [ɮǎ̤ ɮa̤᷈ ɮà̤]. A depressor has no effect on a syllable that's already low, but it blocks assimilation to a preceding high tone, so that the tone of the depressor syllable and any following low-tone syllables stays low. /pʰ/, /tʰ/, /kʰ/ /mp/, /nt/, /ŋk/ Aspiration is lost on obstruents. /ǀʰ/, /ǁʰ/, /ǃʰ/ /ᵑǀ/, /ᵑǁ/, /ᵑǃ/ Aspiration is replaced by nasalisation of clicks. /ǀ/, /ǁ/, /ǃ/ /ᵑǀʱ/, /ᵑǁʱ/, /ᵑǃʱ/ Plain clicks become breathy nasal. /ɓ/ /mb/ Implosive becomes breathy. [ɱb̪vʱ], [ndzʱ], [ndɮʱ] Fricatives become affricates. Only phonemic, and thus reflected orthographically, for /ɲtʃ/. /h/, /ɦ/, /w/, /wʱ/ [ŋx], [ŋɡʱ], [ŋɡw], [ŋɡwʱ] Approximants are fortified. This change is allophonic, and not reflected in the orthography. /j/ /ɲ/ Palatal approximant becomes palatal nasal. /l/ /l/ or rarely /nd/ The outcome /nd/ is a fossilised outcome from the time when /d/ and /l/ were still one phoneme. See Proto-Bantu language. /m/, /n/, ɲ /m/, /n/, ɲ No change when the following consonant is itself a nasal. Zulu has tonic assimilation: high tones tend to spread allophonically to following low-tone syllables, raising their pitch to a level just below that of adjacent high-tone syllables. A toneless syllable between a high-tone syllable and another tonic syllable assimilates to that high tone. That is, if the preceding syllable ends on a high tone and the following syllable begins with a high tone (because it is high or falling), the intermediate toneless syllable has its pitch raised as well. When the preceding syllable is high but the following is toneless, the medial toneless syllable adopts a high-tone onset from the preceding syllable, resulting in a falling tone contour. For example, the English word spoon was borrowed into Zulu as isipunu, phonemically /ísipúnu/. The second syllable si assimilates to the surrounding high tones, raising its pitch, so that it is pronounced [ísípʼúːnù] sentence-finally. If tone pitch is indicated with numbers, with 1 highest and 9 lowest pitch, then the pitches of each syllable can be denoted as 2-4-3-9. The second syllable is thus still lower in pitch than both of the adjacent syllables. When the syllable has a long vowel. When the following syllable also has a depressor consonant. When the following syllable is the final syllable, and is short. Whenever tone displacement is blocked, this results in a depressor syllable with high tone, which will have the low-tone onset as described above. When the following syllable already has a high or falling tone, the tone disappears from the syllable as if it had been shifted away, but the following syllable's tone is not modified. izipunu "spoons", the plural of isipunu from the previous section, is phonemically /ízipúnu/. Because /z/ is a depressor consonant, tone assimilation is prevented. Consequently, the word is pronounced as [ízìpʼúːnù] sentence-finally, with low tone in the second syllable. izintombi "girls" is phonemically /izíntombí/. /z/ is a depressor, and is not blocked, so the tone shifts to the third syllable. This syllable can be either long or short depending on sentence position. When long, the pronunciation is [ìzìntômbí], with a falling tone. However, when the third syllable is short, the tone is high, and dissimilation of the final syllable occurs, resulting in [ìzìntómbì]. nendoda "with a man" is phonemically /nʱéndoda/. /nʱ/ is a depressor, but so is /d/, so tone displacement is blocked. Consequently, the pronunciation is [nʱěndɔ̀ːdà], with rising pitch in the first syllable due to the low-onset effect. Palatalisation is a change that affects labial and alveolar consonants whenever they are immediately followed by /j/. While palatalisation occurred historically, it is still productive, and occurs as a result of the addition of suffixes beginning with /j/. A frequent example is the diminutive suffix -yana. Moreover, Zulu does not generally tolerate sequences of a labial consonant plus /w/. Whenever /w/ follows a labial consonant, it changes to /j/, which then triggers palatalisation of the consonant. This effect can be seen in the locative forms of nouns ending in -o or -u, which changes to -weni and -wini respectively in the locative. If a labial consonant immediately precedes, palatalisation is triggered. The change also occurs in nouns beginning in ubu- with a stem beginning with a vowel. Zulu employs the 26 letters of the ISO basic Latin alphabet. However, some of the letters have different pronunciation than in English. Additional phonemes are written using sequences of multiple letters. Tone, stress and vowel length are not indicated. /ɓ/ ubaba /úɓaːɓá/ "my/our father"
/b/ ukubhala /úɠubâːla/ "to write"
/ǀʰ/ ukuchaza /uɠúǀʰaːza/ "to fascinate/explain"
/ɮ/ ukudla /úɠuːɮá/ "to eat"
/ᶢǁʱ/ ukugxoba /uɠúᶢǁʱoːɓa/ "to stamp"
/h/ ukuhamba /úɠuháːmba/ "to go"
/ɬ/ ukuhlala /uɠúɬaːla/ "to sit"
/ɠ/ ukuza /uɠúːza/ "to come"
/mʱ/ umama /úmʱáːma/ "my/our mother"
/n/ unina /úniːna/ "his/her/their mother"
/nʱ/ nendoda /nʱéndoːda/ "with a man"
/ᵑǀ/ incwancwa /íᵑǀwáːᵑǀwa/ "sour corn meal"
/ᵑǀʱ/ ingcosi /íᵑǀʱoːsí/ "a bit"
/p/ ipipi /îːpíːpi/ "pipe for smoking"
/pʰ/ ukupheka /uɠúpʰeːɠa/ "to cook"
/tʰ/ ukuthatha /úɠutʰáːtʰa/ "to take"
/v/ ukuvala /uɠúvaːla/ "to close"
/w/ ukuwela /uɠúweːla/ "to cross"
/wʱ/ wuthando /wʱúːtʰâːndo/ "It's love." /ǂʰ/ ukuxhasa /úɠuǂʰáːsa/ "to support"
/j/ uyise /újiːsé/ "his/her/their father"
/jʱ/ yintombazane /jʱintómbazâːne/ "It's a girl"
Reference works and older texts may use additional letters. A common former practice was to indicate the implosive /ɓ/ using the special letter ɓ, while the digraph bh would then be simply written as b. Some references may also write h after letters to indicate that they are of the depressor variety, e.g. mh, nh, yh, a practice that is standard in Xhosa orthography. Very early texts, from the early 20th century or before, tend to omit the distinction between plain and aspirated voiceless consonants, writing the latter without the h.
Nouns are written with their prefixes as one orthographical word. If the prefix ends with a vowel (as most do) and the noun stem also begins with a vowel, a hyphen is inserted in between, e.g. i-Afrika. This occurs only with loanwords. Morphologically, it is an agglutinative language. All the strong people of the farm are felling (trees). The various agreements that qualify the word 'abantu' (people) can be seen in effect. Its verbal system shows a combination of temporal and aspectual categories in their finite paradigm. Typically verbs have two stems, one for present-undefinite and another for perfect. Different prefixes can be attached to these verbal stems to specify subject agreement and various degrees of past or future tense. For example, in the word uyathanda ("he loves"), the present stem of the verb is -thanda, the prefix u- expresses third-person singular subject and -ya- is a filler that is used in short sentences. Suffixes are also put into common use to show the causative or reciprocal forms of a verb stem. Most property words (words encoded as adjectives in English) are represented by relative. In the sentence umuntu ubomvu ("the person is red"), the word ubomvu (root -bomvu) behaves like a verb and uses the agreement prefix u-. however, there are subtle differences; for example, it does not use the prefix ya-. Unjani? / Ninjani? How are you (sing.)? / How are you (pl.)? Ngubani igama lakho? What is your name? Isikhathi sithini? What's the time? Ngingakusiza? Can I help you? Uhlala kuphi? Where do you stay? Uphumaphi? Where are you from? Hamba kahle / Sala kahle Go well / Stay well, used as goodbye. The person staying says "Hamba kahle", and the person leaving says "Sala kahle". Other translations include Go gently and Walk in peace. Ukhuluma isiNgisi na? Do you speak English? Uqonde ukuthini? What do you mean? ^ Hammarström, Harald; Forkel, Robert; Haspelmath, Martin, eds. (2017). "Zulu". Glottolog 3.0. Jena, Germany: Max Planck Institute for the Science of Human History. ^ "Ethnologue: Zulu". Ethnologue. Retrieved 5 March 2017. ^ "Ethnologue: Shona". Retrieved 6 March 2017. ^ sahoboss (3 April 2011). "Zulu". South African History Online. Retrieved 17 June 2018. ^ Spiegler, Sebastian; van der Spuy, Andrew; Flach, Peter A. (August 2010). "Ukwabelana - An open-source morphological Zulu corpus". Proceedings of the 23rd International Conference on Computational Linguistics. Beijing, China: Tsinghua University Press. p. 1020. ^ "pansalb.org.za". Archived from the original on 17 December 2007. Retrieved 17 December 2007. ^ Magagula, Constance Samukelisiwe (2009). Standard Versus Non-standard IsiZulu: A Comparative Study Between Urban and Rural Learners' Performance and Attitude. Durban: University of KwaZulu-Natal. Colenso, John William (1882). First steps in Zulu: being an elementary grammar of the Zulu language (Third ed.). Martizburg, Durban: Davis. Wikivoyage has a travel guide for Zulu phrasebook. Wikimedia Commons has media related to Zulu language. Dryer, Matthew S.; Haspelmath, Martin, eds. (2013). "Zulu". World Atlas of Language Structures Online. Max Planck Institute for Evolutionary Anthropology.